I think people should eat more mussels. Well I mean people should eat and COOK more mussels at home. They’re healthy, tasty, cheap and mighty fast to cook. I got two pounds of P.E.I. mussels for $7 at my local seafood shop. I say two pounds is just barely enough for three people and you can eat it as is with some crusty bread or throw in some pasta with a sprinkle of basil. Most recipe I have seen uses white wine but definitely try and experiment with other types of liquid like coconut milk or Pad Thai sauce or any sort of broth. Get the pasta cooking first. Timing is everything for this dish. Should have the mussels done about the same time the pasta is done cooking and quickly toss them together. When there’s about 7mins left on the pasta cooking clock, get a pot (large enough to hold all the mussels) heated up. When it’s hot add the oil and sliced red onions. Season them a little and cook for couple minutes. Hopefully by now the pasta cooking clock is down to 4mins and that’s when you throw in the mussels along with the broth. After giving everything a good mix, cover with a lid, give it a good shake and cook for 2-3mins. If after 3mins there are still few closed mussels, put the lid back on and cook for another 30secs. Turn off the heat and by now the pasta should be done. Add the pasta straight into the mussels pot, mix everything a bit and season to taste. 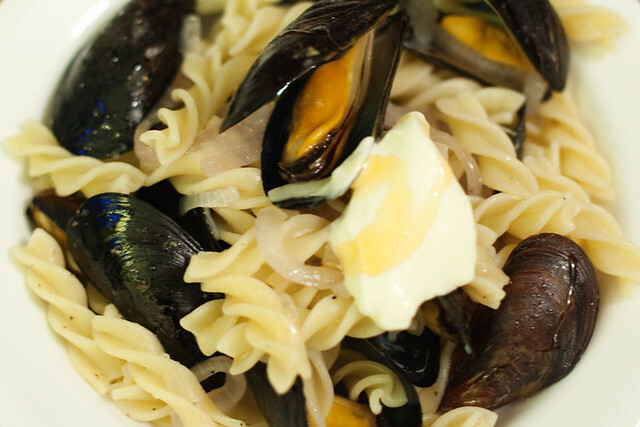 To serve simply divide the pasta and mussels into bowls, scoop some broth into the bowls, added a dollop of creme fraiche and drizzle as little or as much of Mike’s Hot Honey over the mussels and pasta. Make sure to toast up some bread for the broth.